Press the play button above to view the movie. Monte Fitz Roy lies in the heart of Patagonia, in Argentina. It is an iconic mountain with its sheer cliffs piercing the sky, visible from up to 100 kilometres away. You can visit the area in inclement weather and not even see it, but the mountain gods smiled favourably on our cameras and provided a light show to remember. What you are seeing in this movie is a series of steps from the basic capture to the final rendering. The steps are not necessarily the quickest way to create the image, rather they follow the thought process of discovering the image through colour, contrast and exposure. Two quite separate processes are involved: that of pre-visualising the image, and that of rendering it in Photoshop. KNOWLEDGE: 01 | Which Cameras Are Best for Landscapes? 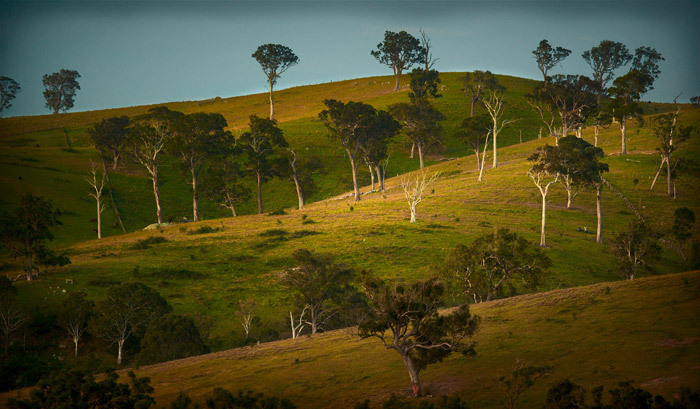 The landscape photograph is traditionally one of great depth and incredible detail. Viewers should feel as though they can step into the image, inspect every blade of grass and touch the rocks and trees. In the past, to capture an image of this quality has required a large format approach, either with 4x5” or 8x10” sheet film or a 6x17cm panorama format on roll film. A few photographers are still using film, but most have moved to digital. The quality we can achieve today with an inexpensive DSLR or CSC exceeds what even large format film could produce. For the purposes of these Masterclasses, I will concentrate on digital cameras, but I acknowledge the romance of using a film camera as well. What is the ultimate landscape camera? There is no single answer to this question and any answer will be subject to disagreement. However, my ultimate landscape camera is the Phase One A-Series with the IQ3 100-megapixel back. However, at a cost in excess of $50,000, this is not a camera many readers will be buying - and there is no need to. You will be able to create amazing landscape photographs with a $500 camera, so this section is really just to put you in the picture. However, if money were no object and your only consideration was maximum image quality, then you would want to be shooting with a medium format digital camera or back. This might not be the only camera you use. On some trips I take a DSLR instead of or in addition to my medium format outfit. However, a 100-megapixel digital back (or more) represents the ultimate capture device for landscape photography, easily exceeding the quality we associated with 8x10” sheet film. There are three main reasons that a medium format digital back is superior to a DSLR or CSC camera. The first is the number of pixels – the resolution and detail can be much higher. The second is that a medium format digital back has no anti-aliasing filter, whereas most DSLRs (but not all) generally do. Anti-aliasing filters, which reduce moire patterns, effectively blur the image slightly (and this is one reason why you must always sharpen a DSLR image at some stage). Finally, and perhaps most importantly, a medium format digital back has a much greater dynamic range than a DSLR. DSLRs typically can record a nine to eleven EV (stop) tonal range, whereas medium format digital is from eleven to fifteen EV. You can get around this limit to a certain extent by bracketing your exposures with a DSLR, but exposure for exposure, the medium format digital back is the king pin. Not all Masterclass readers will be in the market for a medium format digital back. They are expensive. However, if you’re looking at the work of leading landscape photographers around the world and wondering how they manage to capture such breathtaking quality, the answer begins with the capture device they use. Yes, you can replicate medium format quality by making multiple exposures and stitching frames (we look at these techniques in the MasterClass), but it takes a bit more post-production and it works best when your subject isn’t moving! Let’s spend a little more time looking at the medium format digital camera before moving onto the best DSLRs for landscape photography. Which Medium Format Digital Camera? So, acknowledging that not everyone is in the market for a medium format digital back just yet, if you were, what sort of camera would you put it on? After all, a digital back is not a camera, it’s just the recording device. If quality is your prime consideration, then the camera system may be dictated by the lenses it uses. Producing a high quality digital back is only one part of a complex equation. Equally important is the quality of the lens that will project the image onto the sensor and the highest quality lenses available today are still ‘large format’ digital designs. Large format lenses are designed to be focused using the camera’s movements (rather than focusing the lens internally), and herein lies one of the keys to their superior performance: the lens can be positioned at an optimum optical distance from the sensor (or film) to produce maximum image quality. Lens designers love large format lenses because there are fewer restrictions to work within. In comparison, when designing lenses for a medium format SLR, the size of the reflex mirror box and the movement of the reflex mirror determine the minimum distance that the lens can be positioned from the sensor. This imposes restrictions on what can be achieved optically. What does this mean practically? Well, let’s compare two excellent lenses, the Rodenstock 23mm large format lens and the Schneider Kreuznach 28mm for the medium format DSLR. The Rodenstock 23mm is small, compact and incredibly sharp from edge to edge. Stopped down to around f8, there are few lenses in existence that can match its clarity and detail. However, the lens must be positioned very close to the sensor and focusing is critical. The lens moves physically less than one millimetre to change focus from infinity to one metre, making it difficult to use with a standard monorail or drop-bed view camera. 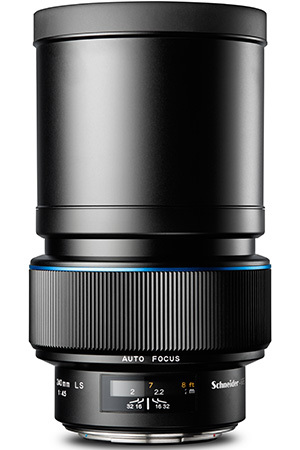 The best option for lenses like this is a helical focusing mount and a special purpose camera like the Alpa TC - which is re-badged as the Phase One A-Series when combined with a Phase One digital back. The Schneider Kreuznach 28mm is a much larger and heavier lens, but it is incredibly easy to use and focus – especially since the Phase One XF camera has very accurate autofocus. Image resolution in the centre of the image is incredibly sharp and detailed, but because the lens is positioned so far from the sensor (to accommodate the mirror box), resolution isn’t as good around the edges of the frame. Spherical aberration is a problem. For some landscape (and architectural) photographers, this could be an issue that directs them towards a large format camera system. For my style of landscape photography, it’s not such an issue because I like to darken the edges of my landscape photos anyway, but it is a limitation. One other point: the view cameras are completely manual in operation, so there is no metering or autofocus. This is an attraction for many photographers, but it also affects the speed with which you can react to a situation. Using an automated medium format DSLR certainly speeds up how quickly you can work if you need to. Landscape photographers wanting to use large format lenses often look at special purpose cameras like the fully manual Alpa and Cambo models. These cameras are relatively small and if you’re focused on infinity or the hyper-focal distance (as landscape photographers often are), they are very easy to use. The large format lenses are attached to a helical focusing mount which allows great focusing precision, ideal for the ultra wide-angle lenses, but you are guessing the focusing distance unless you have a digital back that offers live view. The longer the lens, the harder it is for this system to work and so the maximum focal length is around 135mm. This is quite acceptable if you shoot mainly wide-angles as many landscape photographers do, but not much good if you want to attach a telephoto like a 150mm or 300mm lens. To shoot with longer large format lenses, you have to use a drop-bed (field) or monorail camera. These cameras are easy to work with when shooting from telephoto to moderately wide-angle focal lengths, but are more difficult to use with ultra wide-angles like the Rodenstock 23mm. This is not a digital problem, rather an optical one. The alternative is to shoot with a medium format DSLR camera. The mirror box is not an issue for telephoto lenses as the optimum distance from the sensor is greater than the depth of the mirror box. The solution is great for telephoto lens work, but not when you switch to the ultra wide-angles. So, which brand medium format? I use Phase One because of its modular design. However, Hasselblad also produces excellent medium format cameras and we also have to acknowledge a new range of less expensive medium format cameras from Hasselblad, Fujifilm and Pentax that are entering the market. While some of these cameras have started with 50-megapixel sensors, no doubt they will grow to 100-megapixels soon enough and the price is dropping. However, don't forget you have to add in lenses as well, so a budget of $20k is probably needed. Please do not stress this point. This article is written to give you an overview of what is available. It's like telling you what a racing car can do, but most of us drive standard road cars. It's the same with photography and this MasterClass is written for photographers with DSLR and CSC cameras. So fear not! A much more affordable option to medium format is a full-frame digital SLR (DSLR) with as many pixels as you can afford. This is what most readers use. The more pixels you have, the easier it will be to make high quality enlargements. Digital photography will allow you to make big prints very easily, but retaining detail becomes more difficult the larger you go. For instance, a 20-megapixel camera might have a 5616x3744 pixel sensor. Let’s call this 5000 pixels across (to make the maths easier). How big can we make a print and retain high quality? If we print to a standard of 360 ppi, we can make a 14 inch print, perhaps nearly 30 inches if we’re happy to work at 180 ppi (and most printers will perform admirably at this setting). However, compare this with a 50 megapixel sensor with 8688x5792 pixels to play with. Now we can make a 29-inch or 58-inch print on the same basis. The more pixels you have, the better your landscapes are going to look when exhibited on the wall. In the Canon range, the 50-megapixel EOS 5DS and 5DSR produce more quality than the EOS 5D Mark IV with 30 megapixels or the EOS-1D X Mark II with around 20 megapixels. This is good news because the EOS 5DS and 5DSR are considerably less expensive than the EOS-1D X Mark II. They are also lighter which is important for a landscape photographer who has to carry his or her equipment in a backpack, but not as robust. The EOS 5DS/R won’t take as many knock as a 1D X, nor is it as water and dust resistant. However, it’s easy enough to look after your camera, even to the extent of carrying a small umbrella or covering your camera with a shower cap borrowed from your hotel room if it’s raining. For photographers using Canon equipment, the EOS 5DSR is the ideal landscape camera. 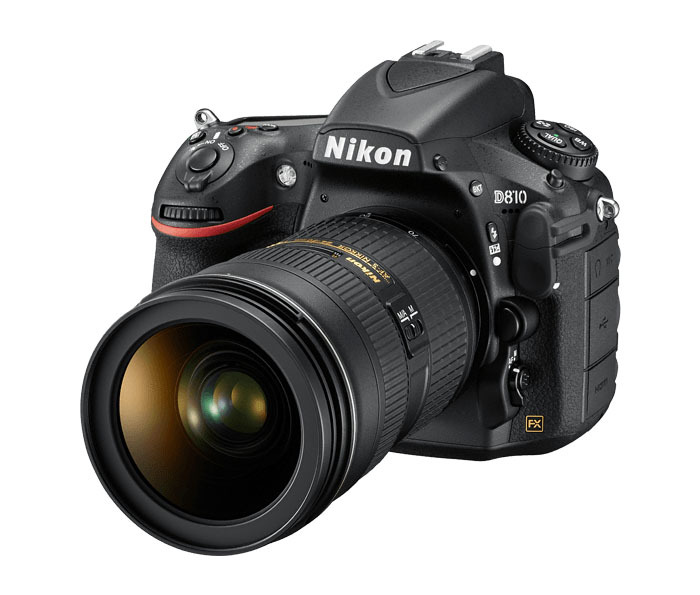 Nikon has several full-frame DSLRs, but really there is just one that's ideal for landscape photography: the Nikon D810. The D810 doesn't have the anti aliasing filter that's found on most DSLRs, plus it has 36-megapixels, so in theory, the images are that much cleaner and crisper, approaching medium format sharpness. The Nikon files are excellent quality and the enlargements quite amazing. I have seen a 50-inch print from the D810 and it looked sensational. What about the other Nikon cameras? Nothing wrong with them, but they don't have the same number of pixels. Simple! Sony also has some great models that are also small and compact and with technology changing all the time, you should review what is available after reading this article. However, we would generally steer you towards a full-frame DSLR model. So why a full frame instead of an APS-size sensor? Just as medium format sensors have advantages over the smaller DSLR format, so does a full-frame DSLR sensor have advantages over an APS-size sensor. Simplistically speaking, larger pixel wells (sites) can hold more photons which gives an improved dynamic range, and larger sensors can also hold more pixels at larger sizes. However, I acknowledge that many readers might never notice the difference, so if you have a smaller sensor camera, don't worry! It will be fine - guaranteed! However, because we are detailed orientated, when choosing a DSLR camera, we recommend a full-frame sensor with at least 30-megapixels. If your budget doesn’t stretch this far, then purchase as many pixels as you can. A smaller sensor won’t limit your creativity or enjoyment of landscape photography in any way. Your main restriction will be one of output – how large a print you can make, or how much you can crop an image after capture. And if it’s a choice between an APS-sensor or a more expensive full-frame sensor, or better quality lenses, you’re probably better off spending more money on the lenses. To get the most out of our digital image files, we need to set our camera to 'raw' mode and then use a raw conversion program, like Adobe Camera Raw (which is found in Photoshop, Photoshop Elements and Photoshop Lightroom) or Phase One Capture One Pro. This not only allows us to make many creative decisions concerning exposure, contrast and colour, it also lets us remedy some deficiencies in the original capture. This movie describes the basic steps required to convert a raw file for later post production in Photoshop (or a similar editing program). Monte Fitz Roy is the iconic mountain peak from South America's Patagonia. Early morning with 100mm lens. 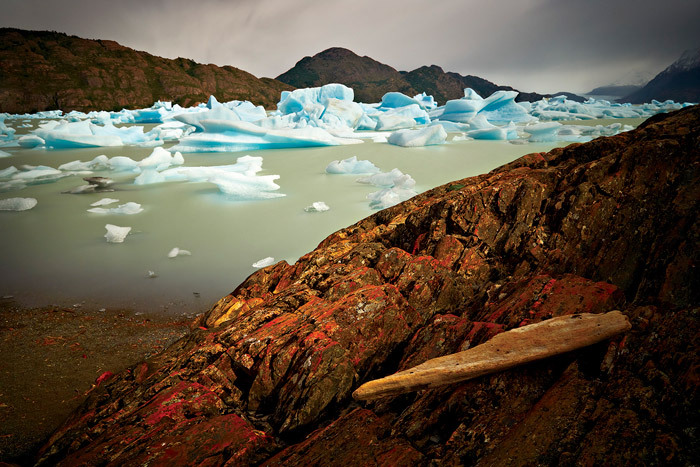 Patagonia lies at the southern tip of South America, spanning both Argentina and Chile. It is a wild, untamed land of sharp mountain ranges, fractured glaciers and deep, blue alpine lakes. The horsemen (gauchos) of Patagonia are renowned for their hardy existence and while their attire isn’t as romantic as one hundred years ago, the lines in their faces tell the same story. 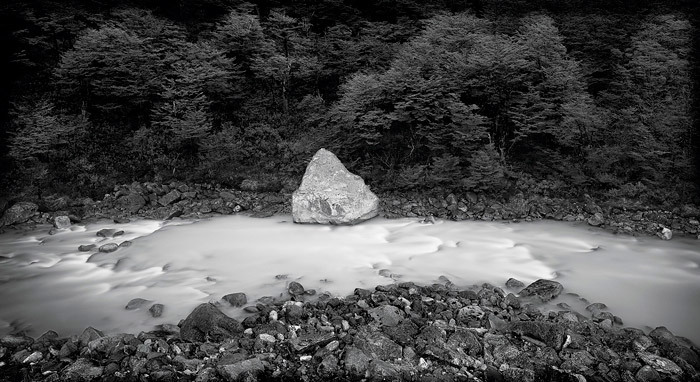 I have visited Patagonia several times now, but the first was with a photography tour. Darran Leal and I took a small band of enthusiastic photographers on a two week tour which included minibus transport and comfortable hotels, plus a few nights in tents below the infamous Monte Fitz Roy and Cerro Torre. Why did I travel with a bunch of other photographers, rather than heading out on my own? For this trip, I felt there were some advantages. First, we have the services of a local guide who knows the area. Some of the places we went to I probably wouldn’t have found on my first trip, so rather than spending time working out what to do and see, the tour took me directly there. Second, this was a photography tour first and foremost, not a general tour. General tours would probably have had us eating dinner in a restaurant when the light was best, whereas photo tours are focused on photography. We didn’t miss anything except perhaps a few hours sleep in our quest for the best light. 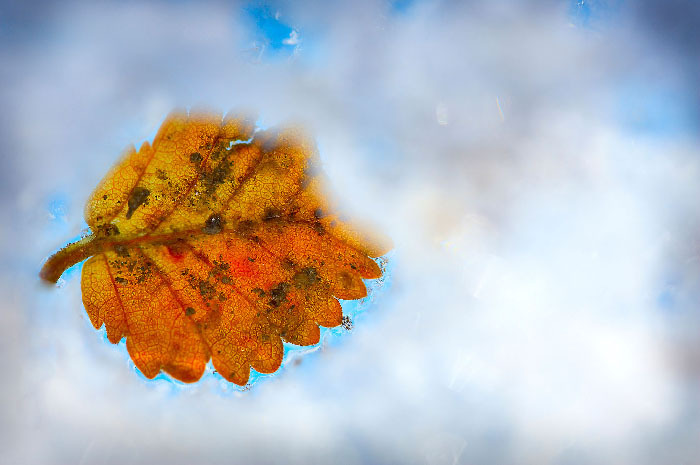 Darran Leal pointed out these small birch leaves which 'buried' themselves in the surface of Moreno Glacier. The tour focused on three main destinations, beginning with the Moreno Glacier which is one of the few glaciers increasing in size (global warming means most of them are decreasing). The beauty of shooting the Moreno Glacier is the nearby vantage point, directly in front and slightly above. There are some simply fantastic angles. We also took a boat tour across the lake and a walk on top of the glacier itself – just along the edges which are far more stable than the centre or the front. Some parts of the glacier are constantly moving and from time to time you will clearly hear the creaks and groans of ice upon ice. The next stop was at El Chalten, a small village below Monte Fitz Roy and Cerro Torre, Argentina’s two key mountains in Patagonia. We left the minibus in town and walked several kilometres or so to an alpine camp. Tents, sleeping bags and a mess tent are permanently staffed, providing you a comfortable base with instant access to the sights of the mountains. There was nothing better than stepping out of your tent and wandering down the track to see some of the most spectacular light shows in the world. We were all there to see the alpine glow (the brilliant reds and oranges on the mountain facades) and we weren’t disappointed. We travelled in spring – November from memory – and so it was cool but not freezing. Well, I say that lightly because there was plenty of snow around, the lakes had small icebergs floating on them, and there were a few times when it snowed quite heavily, even if it melted upon touching the ground. It was important to have warm clothing and gloves. We also had to take spare batteries because we spent three nights away and there was no opportunity to recharge. Today, one spare battery for the latest DSLRs will probably be more power than you need, but even so you should limit the amount of reviewing you do on the camera’s LCD screen. Mind you, it can be hard not to look at the shots you are capturing! The blue icebergs bank up against the shore of Lago Grey. The third location is Torres del Paine in Chile. This is a uniquely shaped mountain range surrounded by grass-covered hills and aquamarine glacial lakes. Unfortunately, the weather wasn’t particularly kind for my first visit (but it just meant I had to go again). It takes a full day to drive around to Chile. 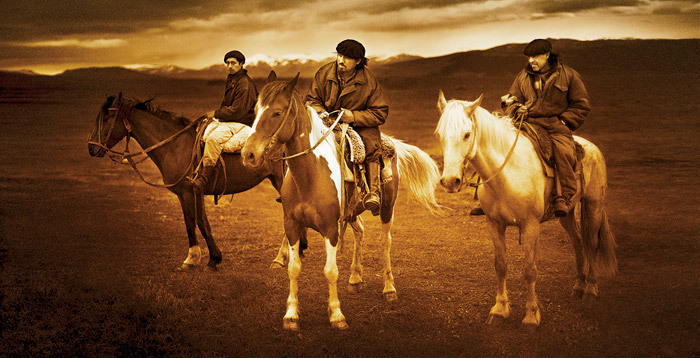 Long, long roads over wide, wide plains of desolate landscapes with hardly a town or a farmhouse in between – you quickly understand why the gauchos are known as some of the most hardy men on Earth! We made many photo stops along the way, including an encounter with a trio of very patient gauchos who were no doubt amused by the group of photographers in front of them. Lago Grey was visited in a strong wind. Well, ‘gale’ is probably a better description and it was hard enough to stand up, let alone walk along the beach or put up a tripod! However, I found a few large rocks behind which I could shelter from the wind – it limited my camera angles, but still it wasn’t hard to take a strong photo. The lake itself was congested with icebergs, oddly-shaped chunks of ice which had sheared off the glaciers at the far end of the lake and had been blown onto the shore – an eerie, fascinating landscape. The Blue Lake around the other side of the massif was iceberg free with some wonderful yellow daisy fields in front of a charcoal black sky. In fact, the sky was so black we wondered if it were a storm and sure enough, five minutes later we were all huddled in the minibus while the front moved through. The storm didn’t last too long and we were soon greeted by a brilliant, clear air with visibility unlike any other place I have seen. Throughout Patagonia, Darran also found us plenty of wildlife and nature opportunities: foxes, guanacos, frogs, condors, ducks, armadillos, skunks and lots of wildflowers. Even though it was cold, it was also spring! Patagonia is an amazing destination and this is just the southern end of Argentina and Chile. Up north in these two countries are even more amazing sights. All it requires is some more time and more disk storage! Snow was falling as I made this exposure. Just love the simplicity of the triangular rock. A strong ND filter was used to get a long exposure time and let the water blur. Shot with a 24mm Canon TSE lens. During the production of the Landscape Photography MasterClass, some of our early subscribers kindly provided some images for critique and review. This has turned into a very popular part of each MasterClass and we have received many complimentary comments about how useful the Critique Session is. Of course, there are no absolutes in photography and so what you view in this movie is really just one photographer's opinion about another photographer's work. However, hopefully the advice and observations can be helpful in improving your own photography. Many readers aren’t interested being full time landscape photographers, but most would happily earn a little extra from their images if possible. No doubt there is money in landscape photography. Photographers such as Ken Duncan and Peter Lik prove the argument, but there is more to their success than what meets the eye. Yes, both produce high quality landscape photographs, but more importantly, they are also high quality business people. This is what most photographers forget when thinking about photography as a business. ‘Professional photography’ comprises two words and, sadly, the majority of professional photographers forget the first one. There are thousands of landscape photographers around the world. Very few of them earn a living full time as landscape photographers. Some of them earn a reasonable second income stream. Most are pottering around the edges. To be really successful as a professional landscape photographer requires you to approach the issue as a true business. You need to be sales and marketing driven and these characteristics describe Ken Duncan and Peter Lik very well. However, the purposes of these Landscape MasterClasses isn’t to turn you into a full time professional, at least not immediately. If this is your passion, then you should pursue it relentlessly, but for most readers, of more interest is how you can earn a few dollars to offset the cost of your passion. And then if you are successful, you can always look at turning full-time later on. Fine art, limited edition prints. You’ve probably seen landscape photography in publications or on walls and thought you could take a better shot yourself, and there’s no argument here. However, the real question you need to ask is, how did the photographer find the person who wanted to buy the image in the first place? A search around the internet will reveal many amazing landscape photographs, but if you wanted a really amazing photograph of your local area, it can be a lot harder to find exactly what you want. This is the problem the buyers of photography face: where do they find the best photographs? And often, buyers of photography don’t always know they are in the market until they see the image! There are many landscape photography galleries around the world, especially in tourist areas. Sometimes the photographs are displayed in a general art gallery or shop, sometimes it’s a purpose-built photography gallery, and on other occasions it might be a market or shopping mall stall, temporarily erected to make some quick sales. The philosophy behind most of these galleries is to display something that’s so impressive, the casual visitor is transformed into an active buyer of landscape photography. To have your own gallery requires a full-time commitment to landscape photography, but to exhibit your photography through an existing gallery can be done on a part-time basis. How would you go about it? Step 1: Decide on an area or subject that you enjoy photographing. Step 2: Research the area for galleries and other retail outlets that might be interested in your chosen subject. If there aren’t any outlets, then maybe you have to go back to Step 1 and choose a subject that will appeal to the galleries. And it might be worthwhile touching base with these galleries to see if they will represent photographers such as yourself, assuming your work is of sufficient quality. Step 3: Research the style of photography and artwork that sells. One of the best ways to do this is to talk to the gallery owners, so you can do this as part of Step 2. Step 4: Build up a portfolio of 20 to 30 breathtaking examples. This might take you one or two years. Step 5: Produce some sample prints and promotional material. This might be a photo book of your images and two or three framed prints in different sizes. Step 6: Approach the galleries and retail outlets with your work, ask if they would be willing to represent you. Some people might argue that this step should be taken before you spend the time creating the work because if the answer is no, then you’re back to Step 1 anyway! However, galleries are unlikely to give you a commitment before seeing your work. Many photographers are rejected by galleries, not because their photography isn’t great, but because it doesn’t match the galleries’ clientele. And often galleries will reject work only to find out later that they made a mistake because the work is very saleable. Selling landscape photography as fine art or home décor isn’t a precise science. In future MasterClasses we’ll cover more aspects of selling landscape photography as fine art or photo décor. There are tens of thousands of publishers around the world with a huge thirst for landscape imagery. Tourist bureaus, travel agents, newspapers, magazine and book publishers, greeting and postcard printers… The list is long and doubly so now when you think about the internet. However, although there are lots of people buying landscape photography, getting them to notice you can be difficult. The people working for these agencies and publishers are very busy. They don’t have time to sift through millions of images to find what they need (they already sift through tens of thousands of images as it is). To get them to look at your work is going to be a challenge. To be successful, even as a part-timer, requires you to target your market, or to get someone else to do it for you. Step 1: Look at the type of photography you are already shooting (or that you are prepared to shoot) and then search for the people who use this type of photography. For instance, if you have lots of photographs of the Great Barrier Reef, then you might look for publishers of travel books and businesses in the Great Barrier Reef area. You need to match your photographs to your market and the best way to do this is to look around. Visit book shops and newsagencies, see what photographs are being used and where. Check out magazines, books, calendars and postcards, then look around the internet as this will probably be your main market. Step 2: Once you have a feeling for the market, build a list of, say, 20 contacts who might be interested in your work. These might be book publishers, calendar publishers or businesses who use photography for advertising. Step 3: Create a library of images that these people might be interested in. The library might be as small as 50 images if you’re trying to convince a calendar publisher to choose 12 for next year’s calendar; or it might contain several thousand images if you’re hoping to sell images of your local area to a diverse range of business clients. What you need to do is make sure you have the type of images they want to buy. Of course, you can never be 100 percent sure – this is the nature of business. Similarly, this is a project that may take several years to complete. Step 4: With your library ready and your contacts in mind, produce a promotional piece that displays your work. It might be a series of cards you post or a website which they can link to. Step 5: Send out your promotional pieces. Setting up a Facebook page is a good idea as well. Step 6: Make contact personally with the people you have approached and ask questions. If they are interested, great! If they are not, why not? The information they provide will be invaluable for you to fine tune your business approach. If you sell your photographs to a publisher, the rates of pay may not be particularly high. Or you might have trouble selling your work, even though it is very good. One alternative is to self-publish your photographs, perhaps as postcards, a calendar or a book. This is a huge topic which we will cover in more detail another time. Suffice to say, self-publishing requires you to outlay the cost of the print run, plus distribute the cards or books. There is a lot of work in self-publishing which can take you away from your photography, so while it can be appealing in concept, there is a lot of unimaginative work involved. A stock library is a business that ‘rents’ out photographs. For example, a publisher might ‘buy the rights’ to use a photograph in a book, or an advertising agency might negotiate exclusive rights to an image for a period of three years in Australia and New Zealand for use with an advertising campaign. The advantage of stock libraries is they do the hard work in attracting people who might like to use your photography. The disadvantage is they are also representing other photographers and they can take a large slice of the income. Depending on where the image is sold, up to 90 percent of the sale can be lost in commissions, leaving you with just 10 percent, but the argument is that it’s 10 percent you wouldn’t have had without the stock library. The standard commission rate is around 60%, with some libraries pushing it up to 80% as the market gets more competitive. There are some very good stock libraries around, but the big ones have so many photographers already, they may not wish to take on newcomers, or if you are accepted, your chances of large sales are miniscule given the number of photographs in the library. The statistics are not on your side unless you have lots of photographs available. A stock library is one way to generate a small source of income and we will discuss stock libraries in more detail in the future as well. However, you should be working towards a minimum of 1000 high quality images before the income stream is going to be noticeable. In the ‘old days’, they used to say you could expect $1 a year for every image you had in the library, so 1000 images might generate $1000 a year, but these days I think it is more likely to be $1 for every 10 images. Again, a complicated area, but if you have good quality images and the time to catalogue them for the library, it can be a useful source of pocket money. These are the main avenues for selling landscape photography. Perhaps the best approach is to keep an open mind over the next year or so as to what is possible. It’s amazing what opportunities arise when you are open to them.